The Four Zoas research papers analyze one of William Blake's most difficult poems to explicate, due to the religious symbolism. In most critical analyses of literary works, discerning the subject matter of a text is an uncomplicated process. 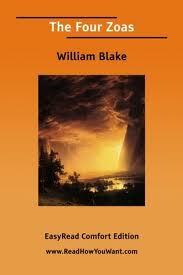 In this respect, Blake’s work presents a special challenge. His choice of subject matter is often of obscure religious origin. Blake employs elements from little-known religious narratives along with his own imaginative creations in elaborate allegorical structures as a means of addressing a wide range of issues, from societal problems to his own psychological dilemmas. In “The Four Zoas,” Blake constructs an intricate religious parable indicting the culmination of the historical and cultural developments that have resulted in the worldview predominant in the 19th century. In Blake’s opinion, a widespread reliance on reason and science has usurped humanity’s necessary connection to spirituality. In “The Four Zoas,” Blake constructs a utopian world in which the full spiritual and mental faculties of human consciousness are ultimately restored, and man recognizes the inexorable link between himself and the whole of the natural world. The “Zoas” referenced in the poem’s title are four beings who are described in several biblical passages. In this poem, Blake aligns each of the Zoas with a portion of the psyche and a multitude of other symbols. Using these characters as a contextual framework, Blake revisions the key events in Christianity, including the creation of the world, the Fall, Judgement Day, and Apocalypse. An understanding of Blake’s extensive system of personification in “The Four Zoas” is central to gaining insight into the thematic significance of the poem. In Blake’s vast symbolic network, nearly every element of “The Four Zoas” is invested with multiple levels of meaning. By using this intricate system, Blake is able to condense many connotations and associations and efficiently evoke an array of symbols with each mention of the individual Zoas. In this discussion, I will focus on the elements personified by each of the four Zoas and their symbolic meaning. Blake begins his narrative with the Zoa that is known in his eternal incarnation as Tharmas. The Zoa Tharmas is associated with his female emanation, Enion. For Tharmas, the Fall of mankind is presented as a “separation from his outer female aspect”. The quality most often associated with Tharmas is strength or power. His symbolic domain is the West. Tharmas is often linked in the text to the art of poetry and the occupation of the shepherd. As an animate life form, Tharmas is associated with the Eagle. His symbolic sense is that of taste, or the tongue. Tharmas’ physical element is water. He is represented by the textual mentions of the heart. In terms of the natural world Tharmas’ analogue is the moon. The Zoa Urizen is emanated as Ahania, his wife. He is also associated throughout the text with the figure of Satan. Urizen is referenced by the virtue of wisdom, the occupation of the plowman, the cardinal direction South, the eye and the sense of vision, the art of architecture, the element of air, the lion, the body part of the head, the moon, and his incarnation Ocalythron. The Zoa Luvah embodies the incarnations of Orc, Elynittria, and Vala. He is symbolically associated with the virtue of love, the cardinal direction East, the art of painting, the occupation of the weaver, the element of fire, the cosmological phenomenon of stars, the body part of the loins, the sense of smell and the nose, and the animate presence of the bull. The Zoa Urthona, embodies the incarnations of Los and Enitharmon. Urthona represents the virtue of creativity, the cardinal direction North, the art of music, the animate creature man, the trade of blacksmiths, the body part of the legs, the sense of hearing and the ears, the physical element of earth, and the topographical element of mountains. The multitude of levels of symbolism, references, and allegory extant in Blake’s “The Four Zoas” result in a significant challenge for any reader undertaking a critical examination of the work. However, the poem is ultimately successful in conveying many tenets of Blake’s philosophy, elegantly couched in a unique amalgamation of inventive stylistic, structural and narrative techniques. Considered by many scholars to bear the makings of a literary masterpiece, “The Four Zoas” effectively imparts Blake’s apprehension of God’s spirit in all of animate nature and his rejection of Enlightenment-era reliance on reason and science. William Blake Poem London - William Blake Poem Research Papers analyze William Blake's poem 'London' and look at it's symbolism, imagery, tone and shape. Personification in Poetry - Give examples of three different types of personification in any of the following poems: She Sweeps with Many-colored Brooms by Emily Dickinson; I Wandered Lonely as a Cloud by William Wordsworth; Two Sunflowers Move in the Yellow Room by William Blake. Paper Masters writes custom research papers on The Four Zoas and analyze one of William Blake's most difficult poems to explicate, due to the religious symbolism.